Like many FROGs, I’ve done fieldwork on the Custom House foreshore, so I decided to take advantage of Open House weekend, when hundreds of official London buildings are open to the public, and see inside. Although TDP is very concerned with ships, jetties etc, I’d never really thought about how the business of selling cargoes, trading, and of course paying customs dues was carried out. But here was the answer. The Custom House is just east of London Bridge, which was the furthest upstream ships could come, and within the City boundaries. There has been a custom house in the area since 1382, but the present building was built between 1813 and 1817. The river front is built of Portland stone and was designed to impress ships’ captains as they came up the river, while the landward side is built of brick and not much to look at. Ships’ captains had to come into Custom House to declare their cargoes and have them assessed for excise duties, and they couldn’t unload or sell the cargo until the duty was paid. In the 19th century, up to 400 ships at a time might be moored outside Custom House. In the past, both the Main Hall and the Long Room were open to the public, so it was not only the captains who came into the building, but traders and merchants came to buy up cargoes and try to sell their goods for export. The Main Hall is impressive enough, but the Long Room (below) is magnificent. It is 190ft (50m) long, and was rebuilt in the neoclassical style in 1825 by Sir Robert Smirke. 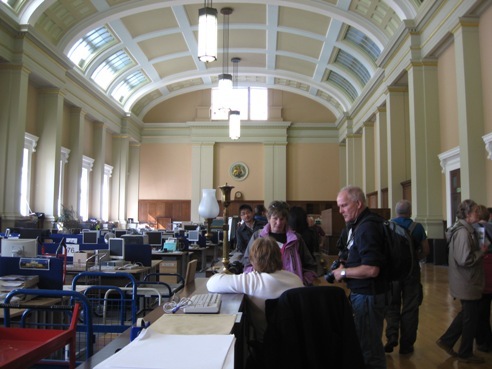 The previous building had developed cracks after only a few years, then the ceiling collapsed and finally the floor fell in, in what became known as the Custom House Scandal. Sir Robert found “gross incompetence” on the part of the contractors, and rebuilt with concrete foundations and fireproofing. The first Long Room was built in 1671 by Christopher Wren, and was so famous that the public rooms of other custom houses in Britain and abroad are also called the Long Room, regardless of their shape. 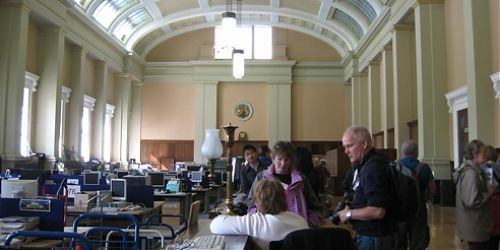 It is divided down its length by a wooden counter – nowadays the room is an enormous open plan office, and the counter has been moved to make office space. But once there was much more room for captains and traders to meet and do deals. On the wall is an original weather vane, which would have told customs officials when the wind was right to bring ships up the river. It was very interesting to see inside the building and find out about its history, and there were interesting prints to look at too. So I’d definitely recommend a visit if it’s open again next September.